This probably isn’t the beach that you were expecting but I’d much rather be here than at the ocean. Cathedral beach is a labeled picnic area on Southside drive in Yosemite. While near Cathedral rocks, the most prominent feature is [wikipop]El Capitan[/wikipop]. Reflection possibilities abound with the Merced river winding through the area. In the winter the gate is almost always closed but it’s a very easy walk from the road. I took this shot on the same morning as the previous entry. The real story about this shot is the fact that it sat, untouched, on my hard drive for almost a year. Generally speaking I’m usually very good about sorting my images right after a shoot. Apparently I’d been so happy with the previous shot that I didn’t bother to go through the other images from that morning. Processing this shot yesterday was a lot like finding a lost wallet with a 20 dollar bill inside. As luck would have it, I found a few more from the same morning but I’ll save those for another day. 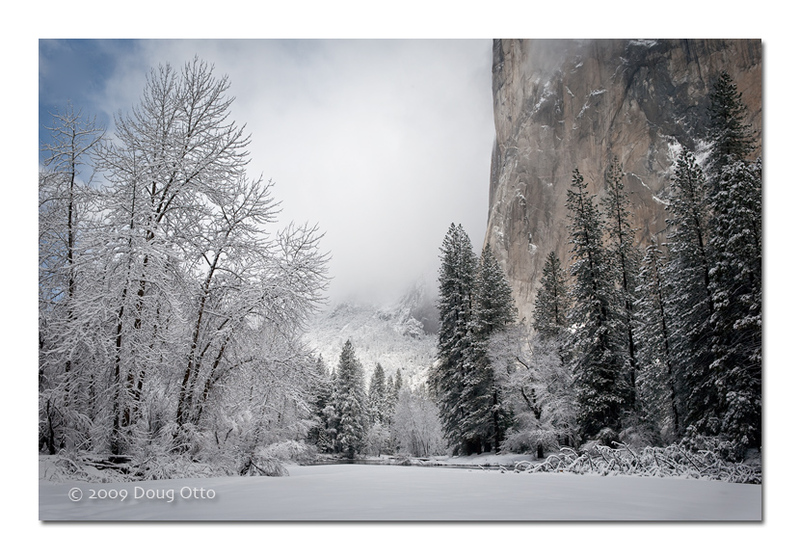 This entry was posted in Photography and tagged Canon 24-70 f/2.8L, Canon 5D, cathedral beach, doug otto, el capitan, Merced River, Photography, snow, winter, yosemite, yosemite national park. Bookmark the permalink.